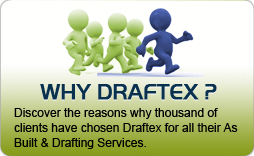 Draftex was founded with a mission to make easy for anyone to obtain accurate As built plans of existing site or structural conditions – on time, for a reasonable fee. We are rated as number 1 in As Built Service in new york city, we provide clear and accurate as built drawings of the built environment with concise details determined by discipline specific drawing standards, on time and on budget. 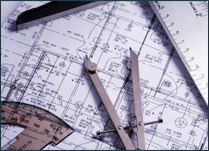 Our Associates use lasers, software to produce accurate Measured Drawings. AKA, as-built drawings, as-built floor plans, laser floor plans, existing condition drawings, etc. While serving primarily the remodel construction industry, we also provide products for space leasing, The Historical Restoration Act, emergency preparedness, asset management and legal documentation of Real Property. Our success is based on years of delivering precisely the drawings people need at the right price. Our latest laser technicality tools enables us to be very efficient and productive at what we do. While our clients are always interested in how we do it, it is our drawings and services that provide us and our clients, with a compelling economic advantage. As built Plans can be for many different reasons, for more information about as built plans see our info page or view our example Floor Plans, and Elevation drawings pages, to see an example of what we have carried out in the past.